The 2017 Oregon Legislature granted the Portland City Council a longtime wish in its $5.3 billion transportation funding package — ownership of an upgraded Southeast Powell Boulevard. Council members have long said Powell would be safer if it was owned and operated by the Portland Bureau of Transportation instead of its state counterpart. But don't expect the improvements or transfer to happen overnight. Although the spending package in House Bill 2017 includes $110 million for safety improvements to a portion of outer Powell, that work will not begin until after the Oregon Department of Transportation finalizes a project list following a public outreach process. "The city has standards for streets, sidewalks, bike lanes and stormwater management systems. We want it brought up to our standards before the transfer," says PBOT spokesman John Brady. And even then, the bill says the state cannot transfer Powell to the Portland Bureau of Transportation until after the Oregon Transportation Commission conducts a study by January 2020 on upgrading additional portions of Powell to city standards. "There are lots of protocols to go through first," says ODOT spokesman Don Hamilton. That's different from what transpired when ODOT transferred the portion of Powell that runs through Gresham to that city in May 2004. Instead of waiting for ODOT to fix it up, city leaders agreed to do the work themselves, provided they could line up the money to improve it in advance. Most of the funding came from a $5.25 million Oregon Transportation Investment Act grant approved by Metro that ODOT supported. Gresham paid an additional $7.5 million with system development charges assessed against construction projects for transportation improvements. The money paid for upgrades from 174th Avenue to Burnside Street. The city assured the majority of the distance was five lanes wide and had sidewalks, lighting, bike lanes, marked crossings and traffic signals. Many Portlanders may not even be aware that Powell is not a city street, since that's its name in both Portland and Gresham. But in fact, Powell is actually just the portion of Oregon Highway 26 that runs through the two cities. Because of that, the state is responsible for maintaining and improving it, but adding safety improvements as the population has grown in East Portland has not been a top priority. The same is true for a number of other state highways that are also streets in Portland. They include 82nd Avenue, which is Highway 213, and Barbur Boulevard, which is Highway 99W. 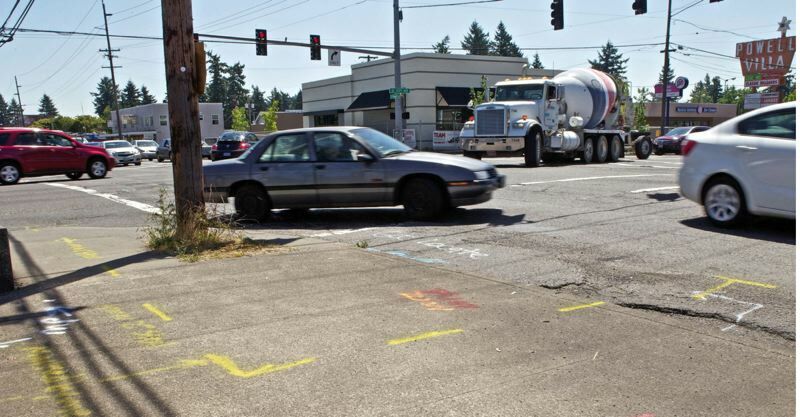 The city can request safety improvements, but ODOT must fund them. The council has come under increasing pressure to improve safety along Powell. This is especially true on outer Powell, which does not even have sidewalks. But the council was reluctant to request a transfer until all of it had been brought up to city standards because of the cost. Even with state approval, the schedule for the improvements and transfer is unclear. Oregon Gov. Kate Brown must first sign the bill, which should happen before too long. Brady says Transportation Commissioner Dan Saltzman wants both accomplished as soon as possible, but if the outer Powell work costs more than $110 million, additional financing will have to be found. The same may be true if the Oregon Transportation Commission study identifies additional work the city insists that the state complete before the transfer. That study will cover Powell from Southeast 9th Avenue to its I-205 intersection. Such transfers have happened in Portland before. For example, Oregon transferred North Interstate Avenue — the original state highway to Washington — before the MAX line was built there. Working out the details correctly is important, because Portland is already eyeing another state highway it wants — Barbur Boulevard, where the next MAX line is being planned as part of the Southwest Corridor project. In fact, a surprising number of well-travelled roads in and around Portland are actually owned and maintained by the state. They include some or all of 82nd Avenue, McLoughlin Boulevard, Macadam Avenue, Lombard Street, Scholls Ferry Road, Farmington Road and Canyon Road. TriMet officials have talked about including funds for improving some of these roads in a November 2018 ballot measure to help finance the proposed Southwest Corridor MAX line.